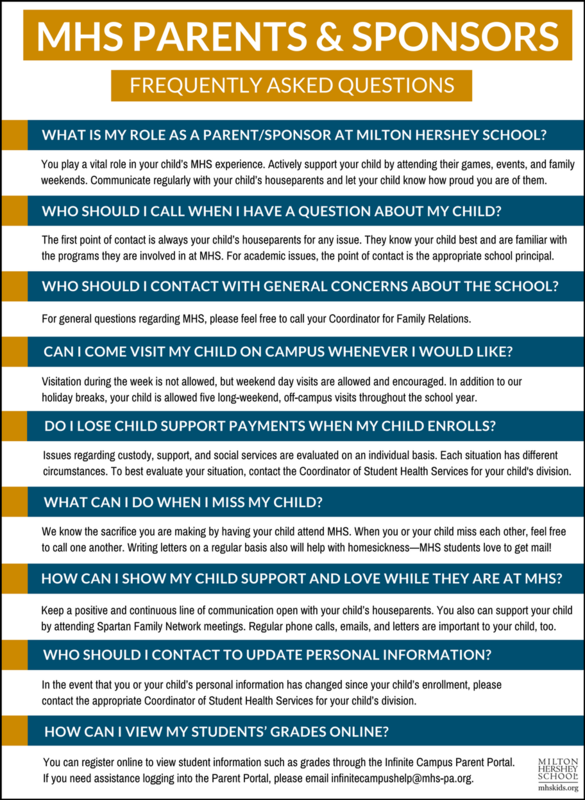 What is my role as a Parent/Sponsor at Milton Hershey School? You play a vital role in your child’s experience at MHS. Your support of your child and the staff of MHS as well as its policies, will contribute to the success of your child at MHS and their future. You have made a big, and many times difficult, decision in having your child attend MHS. There will be times when you will need to be strong in your commitment to both the School and your child. In times like these, it is imperative that you focus on the present and future rewards you and your child will earn by being at MHS. Actively support and encourage your child by attending their games, events, and our family weekends. Make sure you communicate regularly with your child’s Houseparents regarding your child’s progress and let your child know often how proud you are of them. Who should I call when I have questions about my child? First point of contact is always your child’s Houseparents for any issue. They know your child best as well as their program at MHS. If you do not get a resolution or answer from the Houseparents regarding a home life issue, the next point of contact is their Home Life Administrator. For academic issues, the point of contact is the appropriate school Principal. In the event that you have communicated with all the above persons and still have not received the feedback you need, the final option is your Coordinator for Family Relations: Jay Garvey at (800) 283-0001.
Who should I contact with general concerns about the school? For general questions regarding MHS, please feel free to call your Coordinator for Family Relations: Jay Garvey at (800) 283-0001. What if I need to get in touch with my child right away? Your first point of contact when it comes to your child should be their Houseparents. In the event you cannot reach the Houseparents in an emergency, your next call should be to the Home Life office-Elementary Division (717) 520-2410, Middle Division (717) 520-2402, and Senior Division (717) 520-2603. If you need to contact your child during the academic school day, please call the appropriate school Principal-Elementary Division (717) 520-2400, Middle Division (717) 520-2600, and Senior Division (717) 520-2804. For emergencies outside of normal business hours, please call our Campus Services Center at (717) 520-2647. Can I come visit my child on campus whenever I would like? Due to the fact that we serve over 1,700 children and their families, it is impossible to open our campus for visits at any time. Visitation during the week is not allowed, but weekend day visits are allowed as well as encouraged. In addition to our holiday breaks, your child is allowed five long-weekend off-campus visits throughout the school year. As always, we please ask that you communicate regarding requests for visitation and holiday planning with your child’s Houseparents. For our new students, we do recommend that you do not visit them here on campus during their first four weeks so they have time to adjust to their new home and their relationships with those here on campus. Will my child get to come home on a regular basis? In addition to MHS scheduled holiday breaks, students are allowed five long-weekend off-campus visits throughout the school year. As always, we ask that you please communicate regarding visitation and holiday requests and planning with your child’s Houseparents. Do I lose my child support or my Social Security payments when my child enrolls at MHS? Issues regarding custody, support, and any social services are evaluated on an individual basis. Each situation has different circumstances that need to be taken into account when making any kind of decision and/or direction. To best evaluate your situation, please contact the appropriate division Coordinator of Student Health Services with those changes. Please call for Elementary Division (717) 520-3310, Middle Division (717) 520-2264, and Senior Division (717) 520-2267. What can I do when I miss my child? We know the sacrifice you and your family are making by having your child attend MHS. Homesickness can be a two way street. When you or your child find yourselves missing each other, please feel free to call one another and remind yourselves why you have made the commitment to MHS. Writing letters to your child on a regular basis will help with your missing them and our children at MHS love to get mail! Children in the Middle and Senior Divisions have email, which can serve as an excellent opportunity to touch base at any time. If you find that you have done all these things and are still having a hard time dealing with your child being away from home, please feel free to call your Coordinator for Family Relations: Jay Garvey at (800) 283-0001. How can I show my child support and love while they are at MHS? The best way to support your child is to keep a positive and continuous line of communication open with your child’s Houseparents. By doing so, you will know what is occurring in your child’s life and best be able to encourage and provide him or her with positive direction. 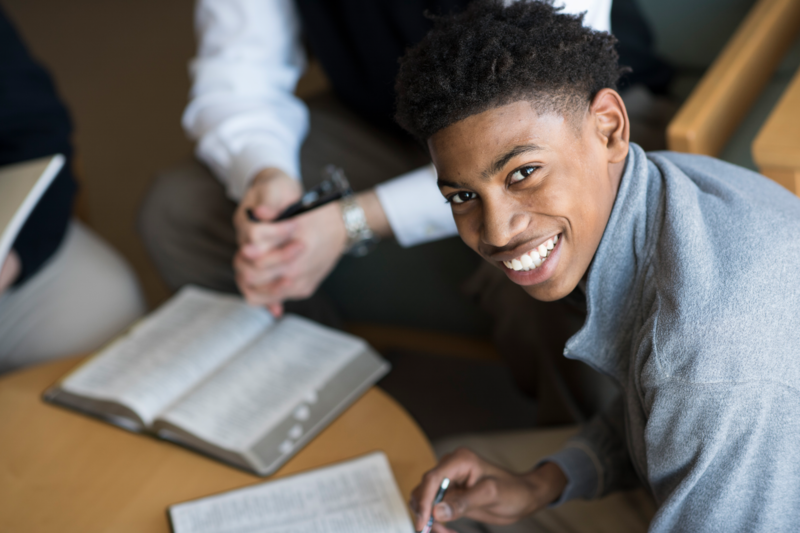 Another way of supporting your child is attending our Spartan Family Network meetings and Family Weekends, both excellent opportunities to learn about what is going on at MHS and to meet and talk with the adults involved in your child’s life at MHS. There are many ways to communicate and show your love to your child. Regular phone calls, emails, and letters are all important to your child. Family weekends and attending your child’s activities and games are great times to witness your child’s gifts and abilities. But the greatest way to show your love to your child during their time at MHS is to remain committed to their enrollment at MHS knowing that it will provide huge rewards for them in their future lives! Who should I contact to update or change any personal information about me or my child such as address or phone number changes, custody issues, etc.? In the event that any of your own or your child’s personal information should change since your child’s enrollment, please contact the appropriate division Coordinator of Student Health Services with those changes-Elementary Division (717) 520-3310, Middle Division (717) 520-2264, and Senior Division (717) 520-2267. Where can I get a copy of my child’s Social Security card, or other documents that I submitted for enrollment? For copies of all documents submitted to enroll your child at MHS, please contact the Coordinator of Admission Systems in the Office of Enrollment Management at (717) 520-2118. How can I view my students’ grades online? Parents/sponsors can register online to view student information such as grades and update their contact information, including their email address, through the Infinite Campus Parent Portal. The web address for the portal is: https://infinitecampus.mhs-pa.org/campus/portal/mhs.jsp. Parents/sponsors receive log-in information on their students’ enrollment day. However, if you need assistance logging into the parent portal, please send an email providing a description of the issue you are having to: infinitecampushelp@mhs-pa.org. Download a PDF of frequently asked questions.